Here we find possible solutions to all the below symptoms of macOS Mojave continuity issues, including continuity camera options grayed out issues, cocoa error 66563, continuity camera could not import photos from device time out, and could not import photos miscellaneous error -1010. Try them out now if you are still suffering from these Mojave Continuity issues. 2. How to Solve macOS Mojave Continuity Issues Directly? We also provide a workaround to help quickly transfer iOS 12 photos to Mac running macOS Mojave and older without using Continuity camera. Try DearMob iPhone Manager, a wired iPhone photo backup and transfer tool to import as many photos from iOS 12 iPhone to Mac if you still unable to solve macOS Mojave Continuity issues. This is a tradditional workaround solution for iOS photo transfer with addtional gems added to it. How to Use macOS Mojave Continuity Camera? Reported by CNET macOS Mojave/iOS 12 beta testers that if you are using beta versions, your Continuity Camera can only work with partial Apple's own apps like Mail, Notes, Pages, ruling out Finder, Keynote and Numbers. *Both your devices should be signed into the SAME Apple ID for them to rightfully and safely exchange data. Note that Continuity Camera DOES NOT require your iPhone being unlocked before you initiate the photo-taking or document-scanning on MacBook. IPhone camera taking photos won't require you to unlock iPhone iOS devices s ince they natively do not have to. Continuity Camera currently works only with Apple's own apps. Third party apps are blooming to catch up. Applications that work with continuity camera are Finder, Mail, Notes, Pages 7.2, Keynote 8.2, Numbers 5.2, TextEdit and Messages. Contacts and calendars are out of the list. Note that, we noticed that Apple has forgotten to list Stickers on its official website, and it does supports continuity camera seamlessly. STEP TWO, open the app that supports continuity camera, for eg. 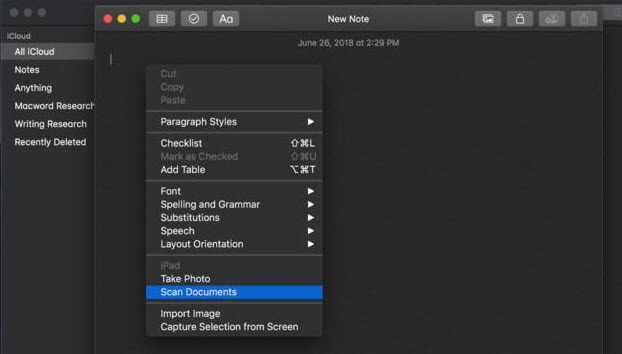 TextEdit, and right click on the text cursor to call up a menu, and you will see "Take Photo" and "Scan Documents" options. And here is when we will meet continuity camera issues. 2. Scan Documents option opens the Camera app and will find the edges of a receipt or document and create a scan, which is saved as a PDF. Read more: Continuity Camera still not working? How to Solve macOS Mojave Continuity Issues? 1. Continuity Camera options grey out issue can be due to that your active top window is not your current app: if you are using Notes, then, Notes window should always be on the top over other open windows. 2. Continuity Camera options grey out issue can also be required network connections failure. This mostly happens when your current application does not accept pictures or PDFs. For example, when i try taking photo from Finder's Search box using Continuity camera, photos could not be imported from iPhone and the warning of miscellaneous error -1010 pops up. If you are using Scan Documents, and cannot import from iphone to the current app - try import from other supported apps and then back to your previously failed one. This iPhone Timeout not importing photos issue can be resulted from poor network connection or some security apps blocking the connection. 1. Do a recheck on your WIFI/Blutooth connection, reset network settings if necessary. 3. Disable your security app for a moment and test if that is the cause. This mostly happens when your current application does not accept pictures or PDFs. For example, when i try taking photo from Finder's Search box using Continuity camera, photos could not be imported from iPhone and the warning of cocoa error 66563 pops up. DearMob iPhone Manager provides the tradditional wired way of iPhone photo transfer, stable, fast, without internet interference. Continuity issues should not get in our way of Photos transfer. Step 2. USB-connect your iPhone to Mac. choose "Export" to transfer photos from iPhone to macOS, and then you can navigate photos to insert in any document files you want. 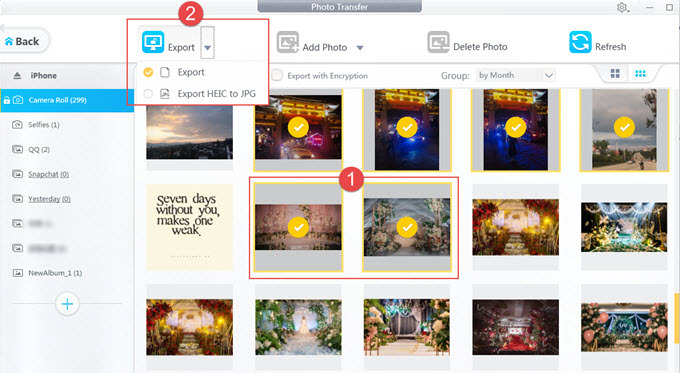 choose "Add Photo" to transfer photos from macOS to your iPhon, click on "Sync". . Import iOS 12 iPhone photos to Mac in bulk or one by one regardless of Mojave Continuity issues.